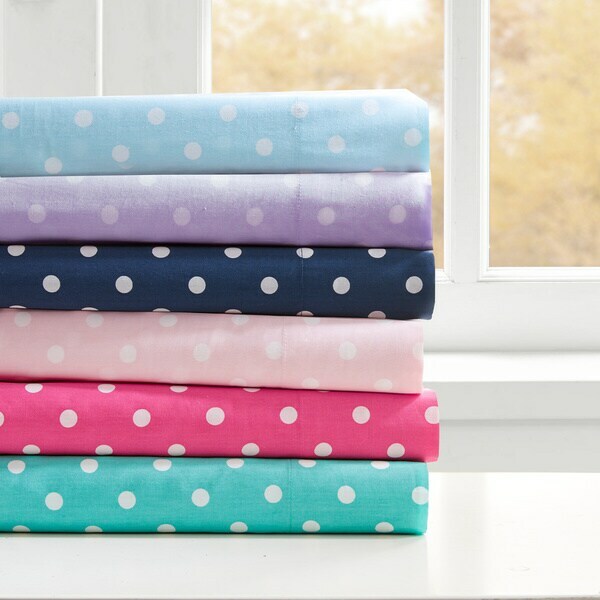 Add a pop of color to your bedroom with this soft polka-dot sheet set from Mi-Zone. The 100-percent cotton set is machine washable and fade-resistant so it looks bright after every wash. Match your decor by choosing from seven fun colors. 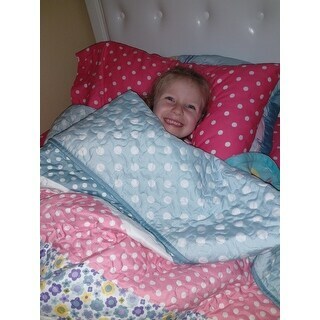 I purchased these sheets for my daughter's bed because the sheets would go good with her comforter. I washed the sheets once I received them. The sheets had deep creases in them after washing and drying them. Washing also did not help with the stiffness of the sheet. If you are looking for a wrinkle-free sheet set that you will not have to iron, this is not the set for you. This is a nice sheet set. It has a light feel to it. Not really soft though. Polka dots are cute....I would buy this set again in another color. I bought these to coordinate with the comforter set that I also bought from Overstock. The sheets are very nice, crisp cotton, and fit a deep mattress well. I ordered the purple color. I highly recommend them. If you like polka dots like I do. This is the sheet set for you. First of all, the color IS a true aqua. It's not too blue nor is it too green. These sheets are NOT whisper-thin. (You know you've seen them before--the sheets you can literally see through because the material is so thin.) Thankfully, these are not that kind of bedding. The one thing I will say, though, is that they stretch so tightly across the queen-sized mattress that I had to have my husband put the fitted sheet on the bed. There's no way I could have done it alone. We're really happy with our purchase, though. Great sheet set ! Lovely colors ! Perfect ! This a very nice sheet set and worth the price I paid for it. I was disappointed that the light pink color I ordered appears rather "faded", hence the four star rating.. I would have preferred that it had been a bit more vibrant, while still being a pretty pastel pink.I am considering ordering a second set in the darker pink color. In spite of the color not being exactly what I wanted (which is a personal preference) I would recommend this sheet set. I have two toddler boys, each in a twin bed, and I wasn't looking to spend a lot of money on their sheets. These get the job done, but they're not something an adult would probably want on their bed, in terms of softness and comfort. Let's face it...these sheets will get washed a lot as we continue potty training, through child sickness, etc., and making a big investment in sheets seems silly. They're cute, they're not scratchy, and they cover the bed. Those were my only requirements, and these sheets serve their purpose. Very scratchy, even after several washings. And now it's starting to pill. Waste of money. Beautiful and goes great with my daughter's quilt! So soft and comfortable! Don't wash up very well!! I only gave these a 3 because if I was going to use these for sheets they would be too rough for my tastes. 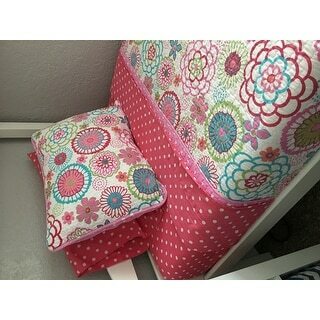 I bought them to make curtains for my granddaughters' room and they are perfect for that. These are cute but kind of stiff - even after washing. 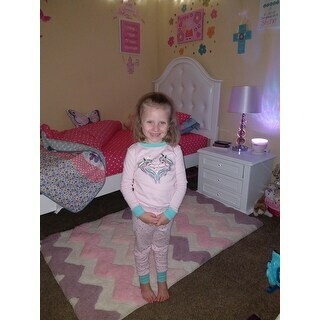 I purchased these sheets for my daughter to replace (what I thought was the same) existing bed set I previously purchased from here. It was different than what I had expected. The polka dots were larger than the previous sheets I purchased but still looked fine. I was unhappy with the quality because one side of the elastic was streched out more than the other side. I only gave 2 stars because of the elastic issue. Other than that the product had no issues. Beautiful color. Perfect addition to my daughters room. Wash well and aren’t super rough. Bought the pink ones for daughter. The pink was really faded after a couple washes and they ripped before they were six months old. I would not buy these again. Cute sheets. Perfect for our toddlers room. I don't know how the sheets will hold up in the wash. The lavender color is dull and muted. It is the only criticism about the product at this time. Colors are beautiful and the sheets are very soft. Didn’t seem to fade after first wash. My daughter loves them and I’m thinking of buying some for myself. "If the Aqua is true aqua, not pale blue, I'll purchase them immediately. Thanks..................."
Aqua is true aqua looks beautiful. I'm happy with this purchase also the quality is soft. "Is the "seafoam" color more turquoise? or more green?" I only like cotton sheets and its feminine. matches the owl bedding perfectly and the reviews were very good. "The pink color appears very pale? Are they that pale pink color or is that just poor lighting when the picture was taken. Many thanks." We try to represent the colors of our products accurately. Unfortunately, due to the difference in monitor colors we cannot guarantee that the color will match exactly what you see on your screen. Thank you for shopping with us. "Is the polka dot color all the way through on the reverse side of the sheet? If not, what does the reverse side of the sheet look like? Many thanks." This sheet set has the polka dot print on both sides.